Right now I’m focused on building tools for framebuilders, so I haven’t actually been making many frames myself—I’m not taking orders currently. Still I thought it might be interesting to catalog some of my past work on here. This is the fourth frameset I made for myself and something like the fifteenth bike I ever made. I finally built myself a disc brake bike with a carbon fork. I made this to replace Deeper Gravy (below) and I wanted to do a slightly more modern build. It's the first one I built with a 44mm head tube. It's also the first bike I built with a serious paint job by a specialist bike painter. Rudi at Black Magic Paint knocked it out of the park with the fade paint job, and I'm very into it. I wanted to try a lower bottom bracket than what I was seeing on a lot of gravel bikes and cross bikes for better road handling, but right away I was riding it on MTB trails a lot and wishing I had more crank clearance in those situations. This was the third frameset I made for myself. It was designed around 700x40mm tires, 1x drivetrain, and Paul Comp Mini Moto brakes (my favorite brakes). It was one of the first bikes I made with a steel segmented fork, and I was really happy with how it came out. The segmented fork allows you to control a lot of variables—axle to crown, rake, lateral tire clearance, different gauge tubing for different feel, etc. I think they look really handsome, especially with the steer tube from Paragon that is machined out of 1 3/8" tubing with an integrated crown race. It was around this time I was starting to find an aesthetic and design style that I was feeling happy with. I think the angular, square-shoulders look of the fork was a good fit with the single bend seat stays. The bike design seemed more holistic and balanced to me than a lot of my previous efforts. 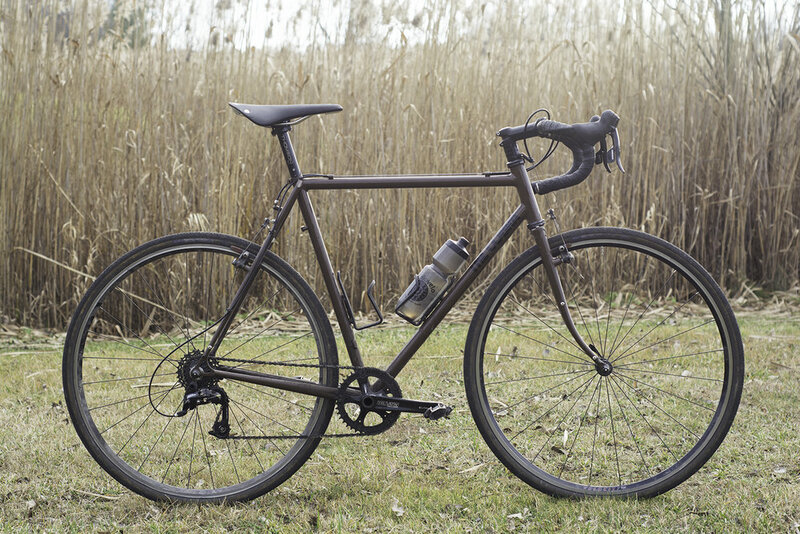 I made this bike in the fall and winter of 2017 at a time when I was turning my attention away from framebuilding generally. I had a full-time job at a CNC machine shop, and I didn't see as much of a future for myself making and selling frames, but I still wanted to tinker in my shop on nights and weekends. I also wanted a commuter bike to ride around Syracuse that wasn't too nice to lock up, something simple and practical. I always wanted a flat-bar bike like this with wider tires. I had the wheelset hanging around my shop for years—Velocity Aerohead rims mounted to Paul Comp hubs. I put the rest together with simple but solid parts, and it’s just a joy to commute on. 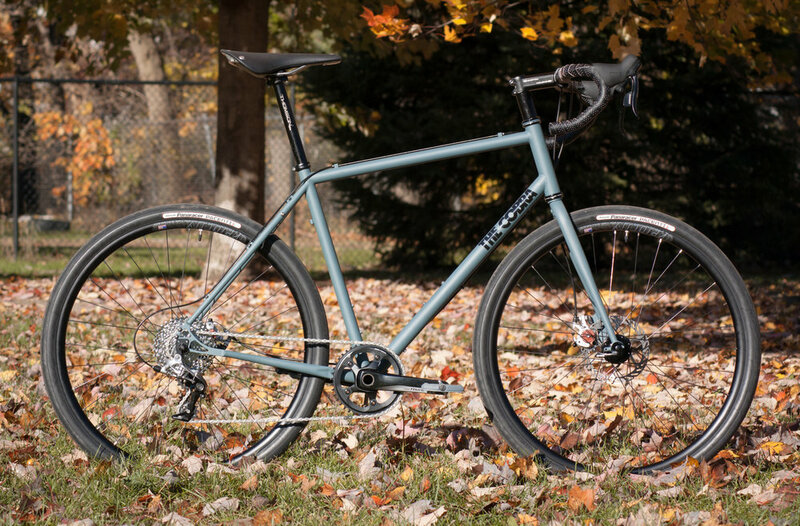 After years of making bikes that I felt had to resonate with the people I hoped to sell bikes to, it was a welcome change to make a bike just for me and my own tastes. I made this bike for my good friend Doug. It can fit 650b MTB tires, or rando slicks with clearance for fenders. 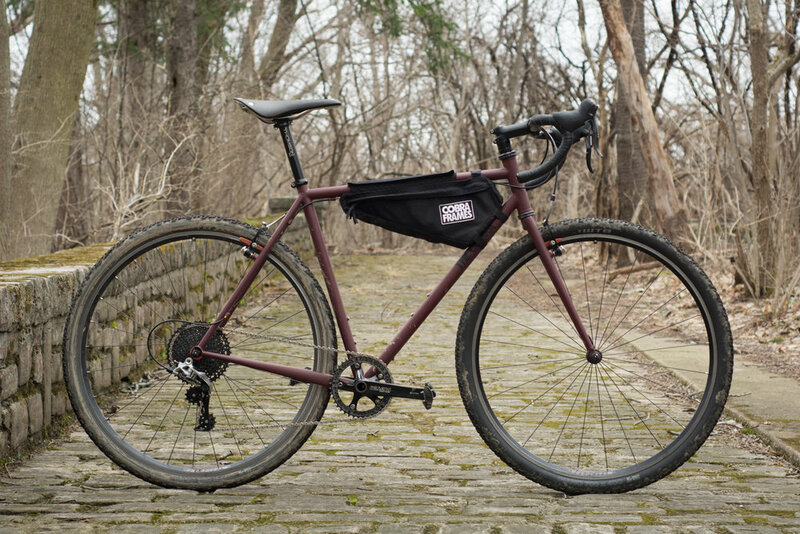 I made a front rack for a Swift Industries bag, too. It's practical, fun, and very versatile. These kinds of bikes can be a headache to get right because you want all of the integrated details to come out right and you want everything to play nice together, but when you get it right it feels awesome. For me this bike was an opportunity to expand the definition of the "road bike" a bit. Clearly roads come in all types, so skinny-tire race machines are only a segment of the road-bike world. Dave's bike clears comfy tires and has a more relaxed geometry. I made this bike in the summer of 2014 for a friend and local racer who beat the snot out of it for years. I tend to baby my stuff too much, so it was good to see someone with the opposite mentality ride one of my bikes hard and to see the bike hold up. I originally built bikes with lugged and fillet-brazed construction, and eventually switched to TIG welding. Here is a gallery of my earlier work.